Yet, love could be an extremely tricky business, because it has so many shades and even they seem to contradict each other. There are countless degrees of emotion between loving one’s neighbor and falling in love with them. The Poet offers a central point from where the definition of Love must start. 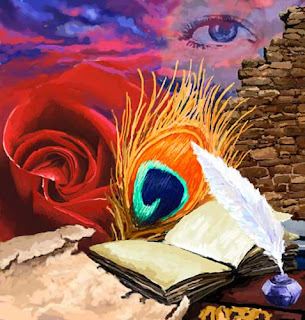 In the prelude, the apparent contradiction between geniuses like Attar, Rumi and the Poet were resolved by the fact that they all sprouted from the common garden of the Muslim nation. The central point, therefore, is now mentioned to be the source from which the Muslim nation itself originated. 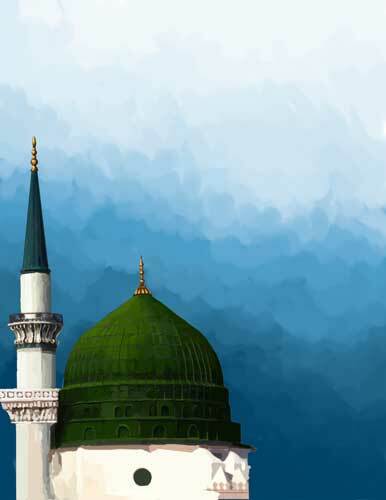 It is Prophet Muhammad, the person whose love cannot be denied, and this is where the Poet begins to define Love. Contradictions resolve themselves as he goes on, and once again you see all the clues about Joseph becoming integrated. Umar, the second caliph, is riding around the town on a camel when his whip falls down. People run towards it to help him, but he stops them. Then he comes down from the camel, picks up the whip, and gets back on the ride. The Prophet’s sword extirpated the race of kings, and hence they could not have existed in Muslim history except as facades. They were symbols for something else, which was “state, laws and government”. Since these were founded by the Prophet, the secret principle which moved them from within was religion itself. This deeper core of religion has been called Sufism (and may be different from ordinary mysticism). Its secret lies in the historical role of the Prophet: With the key of religion he opened the door of this world. This is what you witness as you enter the next chapter. 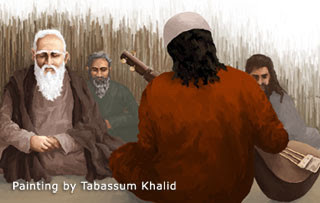 Note: The next chapter, "Qalandar" was posted here as Chapter 8 earlier. The first three comments that you see below are actually about that chapter. The inscription is the title of the first chapter. “The form of existence is an effect of the self,” says the Poet as you enter. “Whatever you see is a secret of the self. Self-affirmation brings not-self to light.” The seed of opposition is sown by the self too. It imagines itself to be other. As such, contradictions do not exist. There will appear to be contradictions, only to be resolves so that you may arrive at the Unity behind them. Here is the basic rule about the Garden, then. Things will appear to contradict each other, but your job is to see beyond. When the Poet said that he had something to say which no one had told before, he seemed to be contradicting all past masters. It turned out that Rumi himself had assigned him the task. Bringing an ideal to birth is different from pursuing a whim or desire. Only that can be “born” which has been conceived according to the principles of life. An ideal is not a mere proposition of the mind. It has to be formed in the depth of the self and it comes into being as the process of its formation is completed. Ideas formed in the mind can lead to hairsplitting, through which one can become further embroiled into contradictions of appearance. Ideals formed in the self bring a sense of purpose and lead to resolution of contradictions.